If you stand at the viewing platform on the top of Erlandson Observatory hill, you can literally look back into time and history. And as you stand there, under your feet beneath the white and yellow daisies flowering amidst the swaying alfalfa, are rocks and debris left by an ancient glacier. The hilltop, so lovely in its own right, is actually a terminal moraine, an end moraine, thus it’s the very spot a vast, almost unfathomable glacier stopped forever. And as you gaze south and southeast, the land falls away hundreds of feet, a thousand feet, steeply and mildly at turns, and we see geologic time visible and real in our gaze. To the left, as you look east, the round, lovely Alleghenies rise blue green, a gift from the crash of two plates once in geologic time — the North American plate and the African plate. The Alleghenies themselves are a gift from Africa. It’s an astonishing thing to stand on top of an end moraine like this. It’s just plain beautiful, for one thing, as the land on three sides stretches for twenty, thirty miles, more maybe. 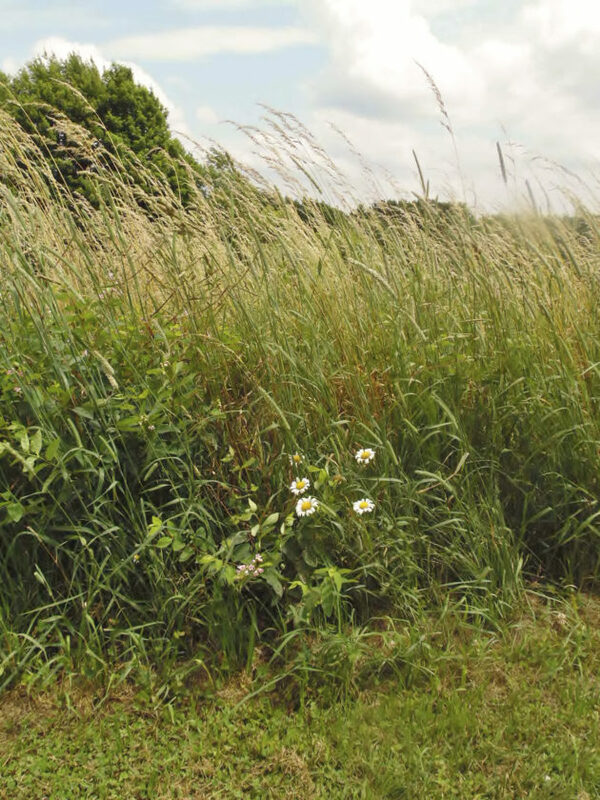 The greens of summer roll out pale to dark, in undulating waves of grass and color. The pines, ubiquitous to this terrain, are dark and brooding even in the summer heat. The cloud forms seem to touch the ground in places, low cumulus, full of rain and storm. An end moraine is the result of an ice age creation, the great glaciers, that pushed their way south nearly north-south directly, down from what we now call Canada into what we know as the United States and our own state here on the borderland. These great glaciers carried in their endless ice and snow rocks and boulders, parts of mountains, trees, for as many years as they existed. What remains beneath our feet is the detritus of one of the great ice sheets of the world. 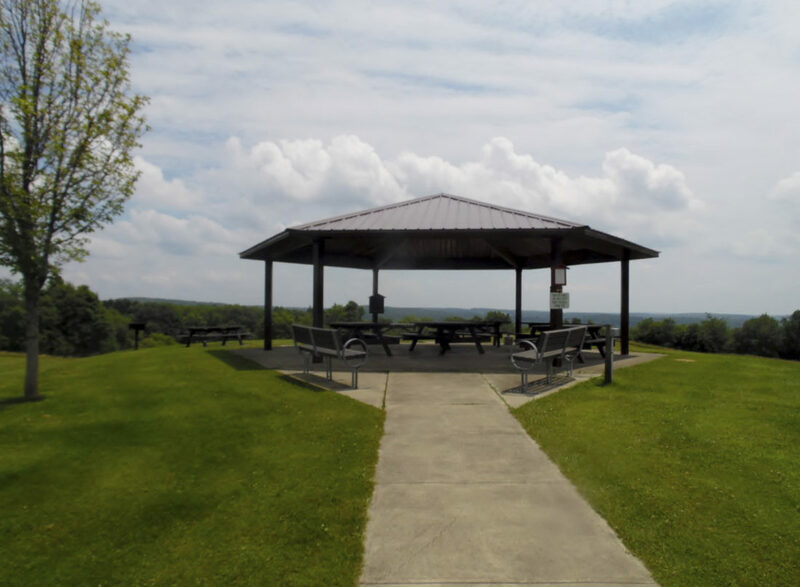 The Tom Erlandson Community Park, located at 465 Oak Hill Road, Frewsburg, has 72 acres of rolling land and remarkable landscape with picnic tables, public facilities, observation sites, and a short trail with a view to Chautauqua Lake on a clear day. According to one website, “The Erlandson Overview Park’s location in the highlands of southeastern Chautauqua County is ideal for observing and interpreting the geological juxtaposition of glaciated vs. unglaciated landscape, one of the unique characteristics of our region. The park itself is in the hummocky “kame topography” of the Wisconsinan glacier’s terminus, marking where the mighty ice sheet made its furthest advance before retreating some 15,000 years ago. In the Cassadaga Creek valley below one can see where the glacier once filled and buried the valley with sediment to the north west, while to the southeast, the v-shaped valley floor of Bone Run attests to the lack of glacial till. You can literally see from above where the glacier stopped.” There is something sacred about such a spot, about the old glacial debris beneath our feet, about the giant boulders left behind so long ago by moving ice. It’s that kind of time we are oblivious to in most of our daily lives, no? We think in terms of the “tyranny of the day,” rising early, getting to work before 9 a.m., enjoying a late afternoon coffee on the porch at 5 p.m., sleeping late on Sundays. We think in terms of next Monday or next week or next month, but rarely do we think in terms of a glacial age that lies literally beneath our feet. I wonder if we had more time to enjoy science and Nature if we would begin to think in larger spans of time, larger, much larger, even, than a human lifetime. Larger, much larger, even than an Ice Age. And if we do so, how does it change our perspective on life? On what matters? 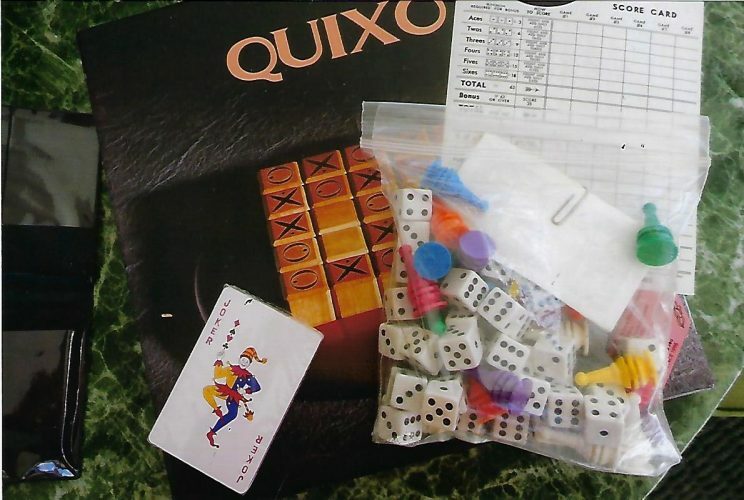 On what we should spend our limited time on next? For we never have enough time, do we? We can, however, go back in time, in memories and in our minds; we can study geology and history and imagine life far back in time. We can look to the future, our own and well beyond, and when we do that, our breadth of mind widens, our vision changes, our perspective on what’s valuable changes. We consider the rocks, the glaciers, the slow melt of time, the dogged ragged days of work and duty. These are our measurements. We recall how much we loved, how deep, a word here and there, a slant of light across a doorway, the smell of zinnias on our 31st birthday…these are how we measure life. Thus I stand at the Erlandson observatory and remeasure myself against the relentless and beautiful wave of time.